SIDEWALK DRAWING AT THE T.O.A.E.! 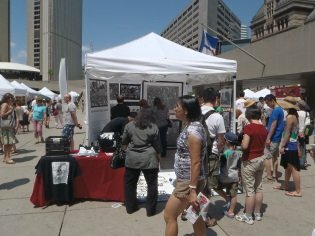 In 2011 I participated in my 9th Toronto Outdoor Art Exhibition. 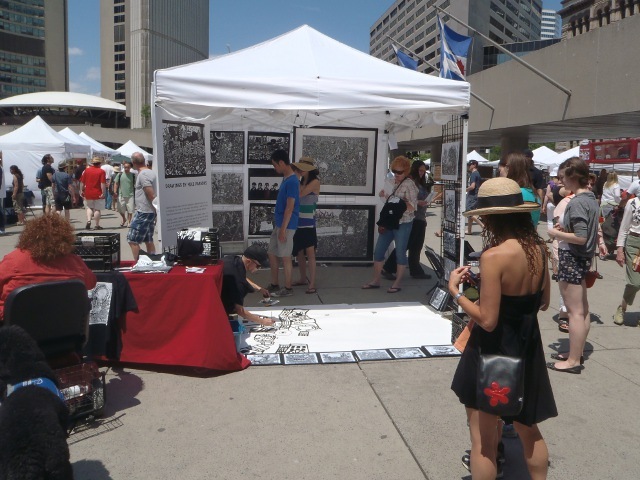 The show is an annual juried event that takes place at Toronto’s Nathan Phillips Square featuring over 400 multi-disciplinary artists from all over the world. I always enjoy this public festival because it attracts enormous and eclectic crowds including tourists, business persons, collectors and dealers as well as many chance pedestrians who stumble upon the event. I did my first public exhibition at the T.O.A.E. in 2002 and have continued to find excitement and inspiration at the venue ever since. 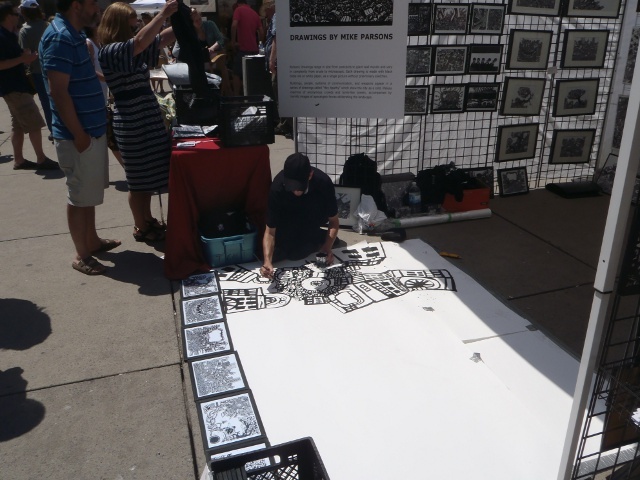 In 2011 I set up a 10 x 10 foot tent display featuring an array of intricate studio artworks as well as an 8 x 10 foot live painting performance. I spent most of the weekend focusing on the storytelling aspect of my exhibition gather audiences into my tent and into my interconnected web of short fables. I recent years I have gotten more and more interested in the verbal explanations and have discovered that this approach really helps to incite face to face interactions. While the painting demonstrations tend to attract bigger crowds, the story-telling approach permits me to examine the audience in more detail. 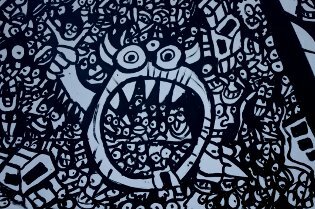 However a combination of the two methods is generally the most exciting and I took the opportunity to draw a giant monster city skyline on the Saturday afternoon. 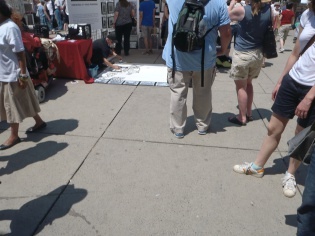 Like all of my previous street art experiments, meeting people at the 2011 T.O.A.E. was the most inspiring part of the weekend. The weather was really good so the crowds just kept coming. The morning started off with a tour bus of students from Spain and I had a lot of fun explaining the work despite our inability to communicate linguistically. 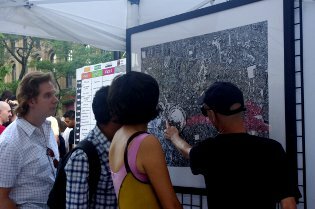 As the show progressed the conversations became increasingly interesting as I met hundreds of new people and was able to reconnect with many others who I hadn’t seen since the previous year’s event or my days out on Queen Street. Since I stopped doing regular outdoor performances I have come to cherish these annual events more because they are really fun places to socialize, share and investigate the city after extended periods of studio work.